Hakusan, Japan, September 13, 2016 – EIZO Corporation (TSE: 6737) today announced Quick Color Match – a new software solution that greatly simplifies CMS (color management system) settings for photo enthusiasts and professional photographers alike. Quick Color Match was developed under a first-ever collaboration between EIZO and Adobe, Canon, and Epson. By combining the know-how and expertise of these leaders in the creative industry, EIZO has developed an ideal software solution that streamlines the color matching and printing workflow. Even with all the right equipment, color matching can be a tedious process – from monitor adjustment to determining the best retouching software and printer settings – achieving an accurate print takes a great deal of time. Quick Color Match simplifies the process by automatically adjusting to the ideal monitor, retouching software, and printer settings so users can focus on editing photos and print their work quickly and hassle-free. Quick Color Match automatically adjusts a compatible ColorEdge monitor’s gain, brightness, gamma, and color space (Adobe RGB) and creates a profile for these settings that is optimized for the selected printer paper type. Dragging and dropping a photo into the Quick Color Match window automatically opens Adobe Photoshop and adjusts the software to EIZO’s recommended color settings based on the printer and paper being used. With either Canon Print Studio Pro or Epson Print Layout print plugin installed, Quick Color Match will automatically select the print profile and color and soft proofing options recommended by EIZO. Users simply need to choose the paper size, type, and quality and they can quickly print photos without worrying about navigating through several windows of technical settings and options. Most monitors in EIZO’s ColorEdge lineup support Quick Color Match software, including its newest models, giving ColorEdge users more options to have a complete and reliable color workflow for realizing creative photographic projects. 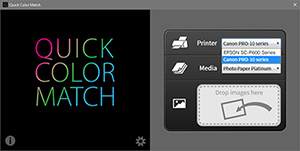 Quick Color Match is an answer to the complexity of the screen-to-print workflow and offers an option to users who want to simplify CMS settings while achieving color-accurate photos.